If you had a live Christmas tree this year and now wonder what to do with it: recycle it (how? where?) or if not, dispose of it (how, how much? ), this page should help you. Many counties have recycling services to put your old Christmas tree to new life. Keep on reading for some general tips and options specific to your area. What Are Your Recycling Choices For Your Holiday Tree? 1. Most areas collect trees during their usual pickup plans in two weeks after Christmas. Find out what is the easiest way to recycle your Holiday tree and where. 2. There are some boy scout troops who would pick up the tree for you for a small price (about 5$). 3. Most of the areas have places like Home Depot where you can drop your tree for free. 4. You can cut the tree so it can fit into the container. 5. Recycle it yourself – see below on this page. You must remove all decorations, lights and tinsel. You can’t recycle artificial Christmas tree. It goes out with garbage. 1. Remove everything from the tree. 2. Usually, length is 4 ft, but there are some locales where you must cut it into smaller pieces so that pieces can fit into the container. In each area is different rule, so you have to check on website. 3. You can collect trees entire January. 4. FREE Drop-off places are also usually available. 5. 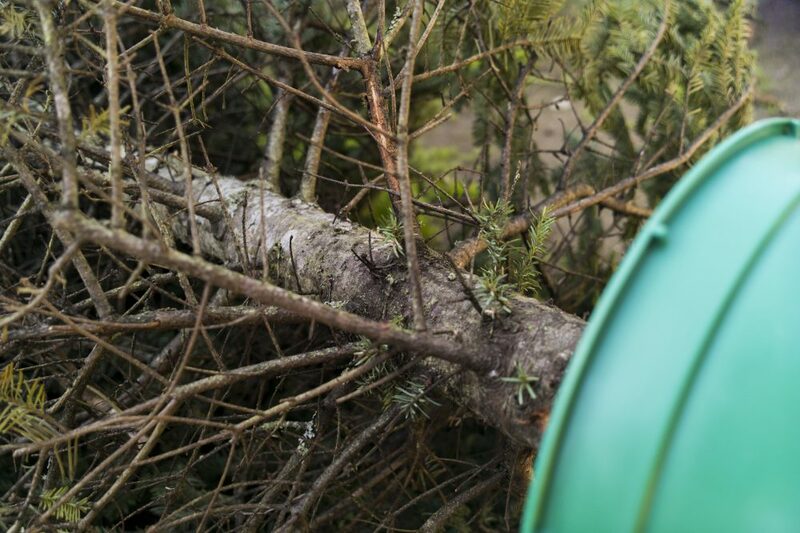 If you were late with collecting, you can cut your tree and put it in your container. • Removing the tree: If you want to remove your tree without a mess, use a plastic bag and put it under the stand of a tree. After the holidays, just take your bag with stand and carry it outside. • In some areas, people use Christmas trees to stop erosion, especially near lake or river. • Fish feeders: You can sink trees into the pond and make a great place to feed the fish. • Bird feeders: Why don’t you place your Holiday Tree in a garden or backyard and then use it as a bird feeder? Use slices of fresh orange to attract the birds. Throughout the year, branches will become fragile so that you can easily cut them manually. • Mulch: A Christmas tree is biodegradable so that you can use its branches as mulch in the garden. • Paths for Hiking Trails – some areas use the chopped trees as a free, renewable and natural path material, so it’s good for the environment and hikers needs! • Living, rooted trees: You can get a tree ready for planting in your backyard after Christmas. Note: trees better thrive in mild climates compared to the north. • Important: Never put Christmas tree in your oven because it contains a lot of flammable oils that can cause a fire in the chimney.